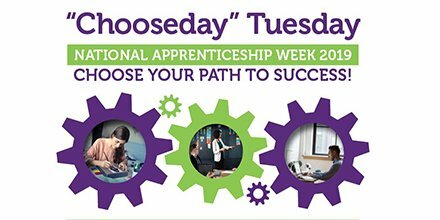 On Tuesday 5th March, Anglian Building Products attended Croydon College for their ‘Chooseday’ Tuesday event to support National Apprenticeship Week 2019, in partnership with CroydonWorks and JobCentre Plus. The event was to highlight the amazing opportunities that we have available, along with delivering an interactive stand where apprentices of all ages could get involved and have a taste of our business. The morning session was attended by 190 pre-booked school students, who were keen to know more about the various career paths available and get an understanding of what an apprenticeship involves. The college also hosted a lunch for local businesses and employers to attend, which also proved a huge success. Initiatives to support Apprenticeships were announced – including ‘100 in 100’ (100 apprenticeships, in 100 days) with Levy support from Croydon Council. We estimated that there were in excess of 130 attendees in the room, with about 95+ companies interested in taking on an Apprentice. “It was great to talk to so many young people who are motivated to find out more about available courses, and how apprenticeships can benefit their career. Croydon College is passionate and dedicated to their students’ futures, and we thank them for inviting us to take part in this fantastic taster day”. Phill Wilkinson, Anglian Building Products representative.